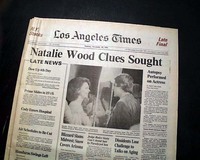 The top of the front has a banner headline: "Natalie Wood Clues Sought" with subhead and photo. 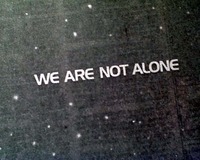 (see) Much more on page 3. 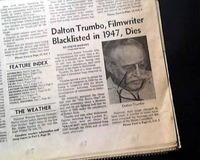 Nice to have this death report in a newspaper from the capital of the entertainment industry. 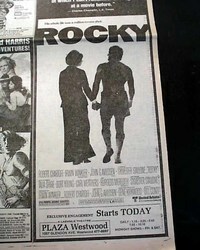 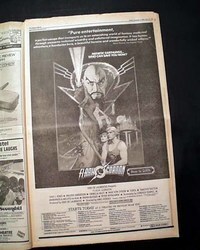 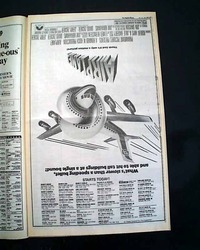 LOS ANGELES TIMES, Nov. 17, 1981 The top of the ftpg. 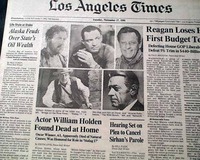 features 5 photos of famed actor William Holden beneath which is the heading: "Actor William Holden Found Dead at Home" with subhead: "Oscar Winner, 63, Apparently Died of Natural Causes; Was Honored for Role in 'Stalag 17' " The article carries over to page 23 and includes 3 more photos. 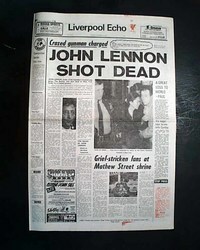 * Disney's, "The Fox and the Hound"
Few could argue for a more desirable and scarce newspaper on the death of John Lennon than this, his hometown newspaper. 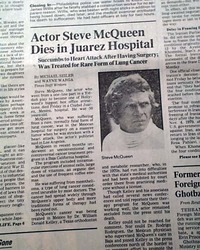 * "The King of Cool"
The front page has a two column heading: "Actor Steve McQueen Dies in Juarez Hospital" with subhead and small photo. 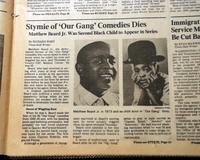 More on pages 28 & 29. 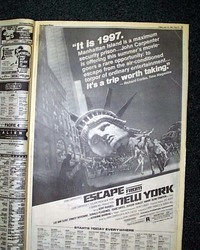 Nice to have from the capital of the entertainment industry. 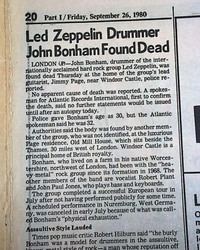 The top of page 20 has a report headed: "Led Zeppelin Drummer John Bonham Found Dead". 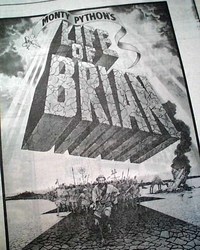 Bonham was widely considered to be the greatest drummer in music history. 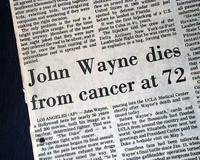 Great to have this report in a newspaper from the home of the entertainment industry. 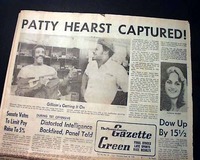 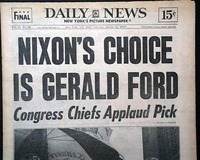 * Great ad for "The Shining"
* "America's Sweetheart" "Girl with the Curls"
The front page of the sport's section has a banner headline: "Petty Wins Daytona After Leaders Crash on Last Lap" with photos of the crash and Richard Petty. 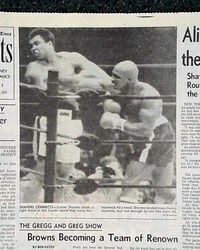 Coverage continues on a following page with a photo of the infamous fight. 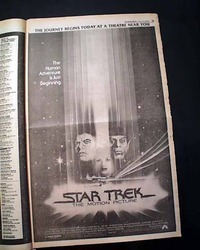 TV GUIDE with the following celebrity and headings on the front page: "Suzanne Somers: 'I Want it All'" "Video Disks Open New Worlds For Viewers." 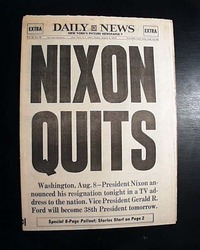 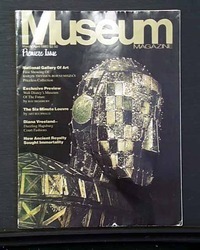 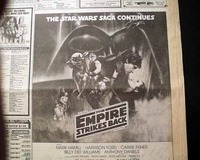 Nov. 25 - Dec.1, 1978 Good condition. 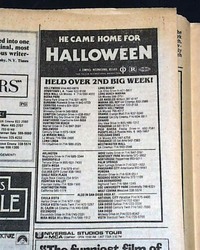 * John Carpenter's amazingly successful, "Halloween"
Inside the "View" section is a ad for John Carpenter's "Halloween" - held over for 2nd week after its Premier Showing. 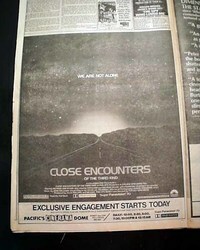 (see) Great to have this uncommon ad in a Hollywood area newspaper. 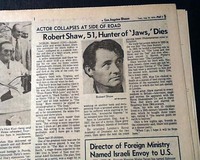 The top of page 5 has a three column heading: "Robert Shaw, 51, Hunter of 'Jaws,' Dies" with photo. 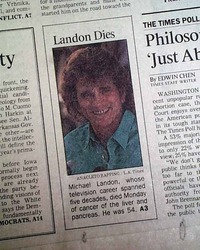 (see) Nice to have this death report in a newspaper from the capital of the entertainment industry. 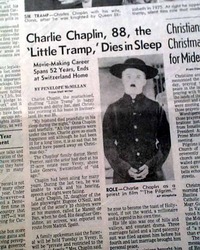 * Silent film - movie era icon - "The Tramp"
This newspaper has a significant & historic advertisement for the movie "Close Encounters of the Third Kind" on page 27. 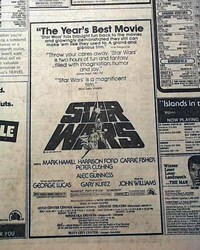 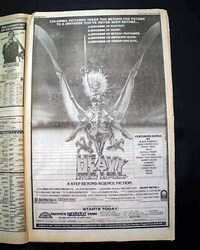 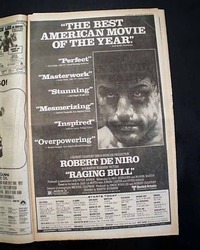 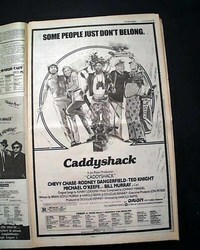 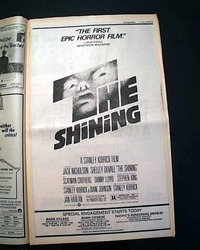 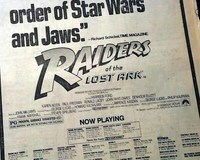 This advertisement is on the opening day the movie made it's premiere making it a great addition for any movie memorabilia collection. 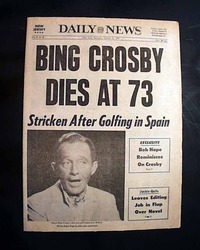 The bold headline announces: "BING CROSBY DIES AT 73" "Stricken After Golfing in Spain" with a photo of him. 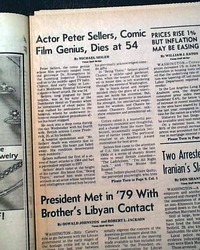 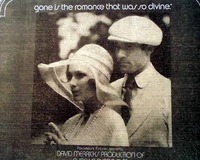 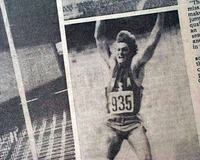 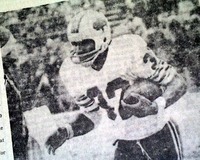 The news report is on page 3 with the centerfold having many photos of his life & movies (see). 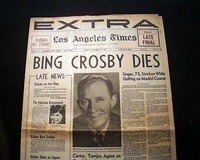 The banner headline announces: "BING CROSBY DIES" with subhead: "Singer, 73, Stricken While Golfing on Madrid Course" with a ftpg. 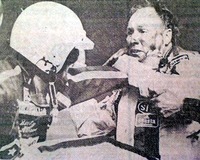 photo of him and another of him & his family. 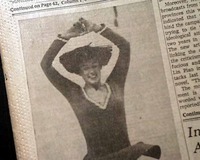 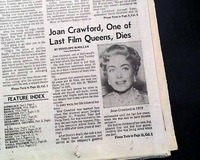 Near the bottom of the front page is a two column heading: "Joan Crawford, One of Last Film Queens, Dies" with photo. 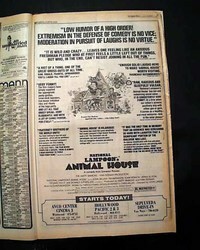 (see) Much more on page 3. 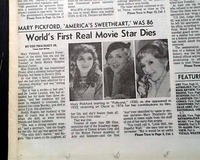 Nice to have this death report in a newspaper from the capital of the entertainment industry. 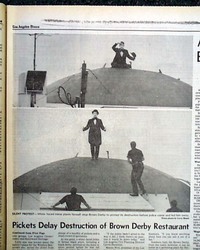 The front page has a two column photo of Dorothy Hamill in action with caption: "Triumph At Innsbruck"
PHOENIX GAZETTE, Sept. 18, 1975 and the ARIZONA REPUBLIC, Phoenix, March 21, 1976. 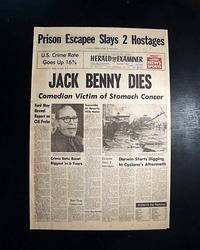 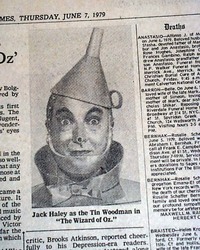 The banner headline announces the death of one of the more famous actor/comedians of the day: "JACK BENNY DIES" with: "Comedian Victim of Stomach Cancer" A front page photo of him as well. 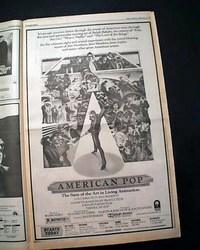 Nice to have this report in a newspaper from the home of the entertainment industry. 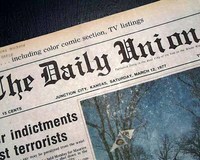 This 28 page newspaper has a six column headline on page 13: "O.J. 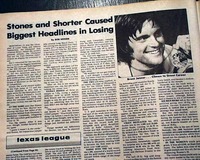 's Odyssey Ends at 2003" with nice photo of Simpson running off the field after the game.